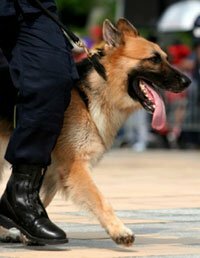 The U. S. Court of Appeals for the 11th Circuit considered an appeal in the Florida case of Edwards vs. Shanley and Lovette (11-11512) that involves the question of whether officers are granted qualified immunity when a Police K9 bites a suspect for five to seven minutes during an arrest. In this incident, Orlando Police Ofc. Justin Lovette initiated a traffic stop on a vehicle driven by Colin Edwards on the night of 12/17/2008. Lovette observed Edwards run a stop sign. Edwards pulled over, but then fled on foot from Lovette because Edwards knew he had a suspended driver’s license. Lovette called for back-up and Orlando K9 Ofc. Bryan Shanley arrived with K9 Roscoe. Roscoe tracked Edwards a half mile and into an open field where Edwards said he laid on the ground prone with his arms spread. Though he heard them and could see their flashlights in the darkness, Edwards did not respond to challenges or commands by the officers. The K9 Handler sent Roscoe to apprehend suspect. Edwards claims he offered no resistance. Edwards alleges that the dog continued to bite him for “five to seven minutes” during which time Edwards says he pleaded for the officers to call the dog off. Edwards further alleges that while the dog was biting him, the officers made no attempt to handcuff him or call off the dog. After the five to seven minutes, Edwards says was finally handcuffed by Lovette, at which time Shanley gave Roscoe a verbal command to release Edwards. Edwards further claimed that the officers now taunted him by saying his leg looked like filet mignon and stated that was why they don’t feed police dogs. Doctors said Edwards had suffered a serious injury to his leg’s muscles and tendons necessitating a six-day stay in the hospital. Edwards was charged with fleeing and eluding, driving on a suspended license, resisting arrest without violence, and battery on a police dog. Edwards sued the officers in April 2010, Shanley for excessive use of force and Lovette for failing to stop the attack, both in violation of Edwards’ rights under the Fourth Amendment. Upon considering the suit, the U. S. District Court for the Middle District of Florida summarily found in favor of the officers, citing that they were entitled to qualified immunity. The U. S. Court of Appeals for the 11th Circuit reversed and remanded the case for further proceedings back to the District Court. This case does not set a brightline rule about how long a police dog can or should bite a suspect, rather it recognizes that qualified immunity does not exist in this particular incident based upon existing documentation. After an examination by our municipality’s attorneys, my department has changed its K9 use of force policy to include documenting the approximate duration of a bite. This would forestall any question such as this over whether the handlers are due qualified immunity. Randall spent eight years as a Police K9 Handler. His two German Shepherd Dogs were deployed for Patrol, Narcotics, and SWAT. He also handled a narcotics-trained Labrador Retriever. He is currently his department’s K9 Unit Sergeant.